Peconic Pediatrics is proud to recognize our own pediatric nurse practitioner Michelle Wruck. 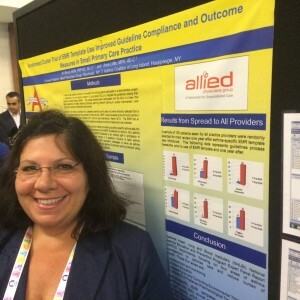 Michelle has just returned from the American Academy of Pediatrics Annual Conference in San Diego. While there she presented a poster abstract reflecting her hard work and great outcomes supporting children with asthma at Peconic Pediatrics. In particular, Michelle was able to demonstrate better asthma control by utilizing special features in the Allied Physicians Group electronic medical record that Peconic uses. Congratulations Michelle. Keep up the good work. We are proud to have you as part of our team here in Riverhead, NY.